Moussonia is unusual in the Gloxiniinae in that it does NOT have scaly rhizomes but has nonetheless, been shown to belong in this grouping. The plants are relatively sturdy upright herbs, sometimes large enough to be considered subshrubs with attractive often brightly colored (red, orange, yellow) flowers. Distribution is from Mexico to Panama in Central America, in damp forests. 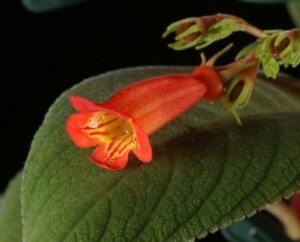 The species were once included in Kohleria, but were separated from that genus on the basis of morphological factors, with subsequent molecular analysis supporting the separation.